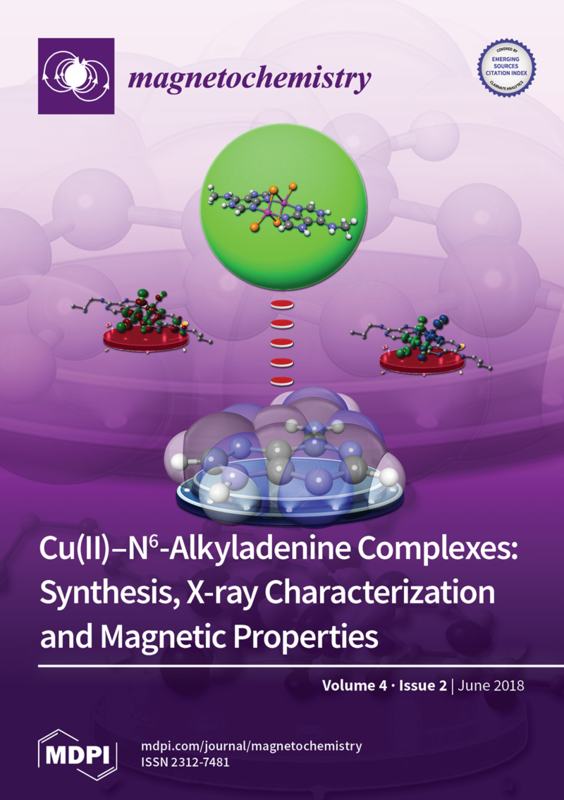 Three new dinuclear copper(II) complexes [Cu2(μ–HLn)2(μ-Cl)2Cl2]Cl2 (1–3) have been synthesized and structurally characterized by single-crystal X-ray diffraction, where HLx, (HL1 = N6-propyladeninium, HL2 = N6-butyladeninium and HL3 = N6-isobutyladeninium) are N6-alkyl bidentate NN donor adenine bases. Complexes 1–3 exhibit a coplanar arrangement of both N6-alkyladeninium moieties with UD conformation, with the terms U(up) or D(down) referring to the coordination of each pyrimidinic N3 atoms to the upper or lower metal center. In the three complexes, both copper atoms are five-coordinated (N2Cl3 donor set), resembling a compressed trigonal bipyramid. Each adenine moiety is protonated in N1 and the positive charge balanced by chloride counterions. 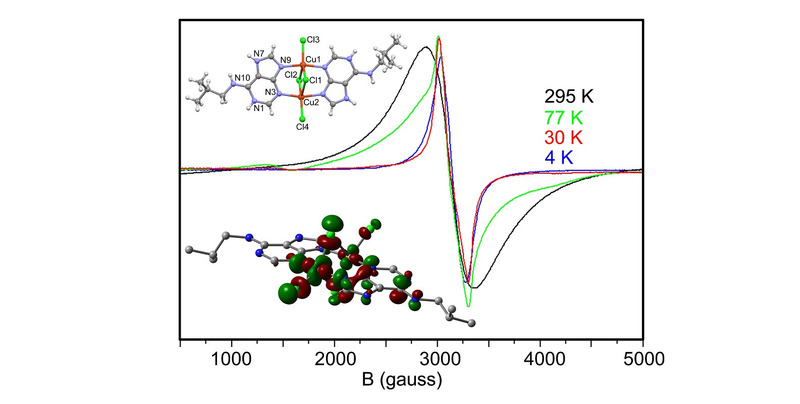 Magnetic measurements of complexes 1 and 3 in the 2–300 K temperature range indicate antiferromagnetic coupling with J = −156.1(7) and J = −151(2) cm−1, respectively. Density functional theory calculations have also been performed in order to estimate the exchange coupling constants in these complexes. The theoretically calculated J values are in good agreement with the experimental values.